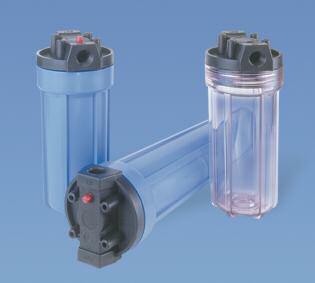 Top quality and economically priced plastic filter housings. 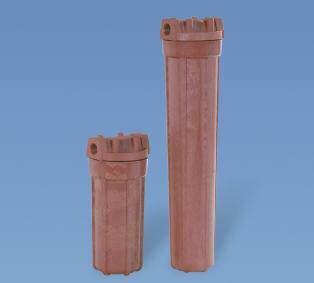 • Thick side walls with heavy-duty ribs to provide greater strength. • Temperature rated to 125°F (52°C) (standard); 200°F (93°C)(high temperature). HD4500CB34 10" No Clear Black 3/4"
HD4500CB34PR 10" Yes Clear Black 3/4"
HD4500HT34 10" No Red Red 3/4"
HD4500BB34PR 10" Yes Black Black 3/4"
HD4500BL34 10" No Blue Black 3/4"
HD4500BL34PR 10" Yes Blue Black 3/4"
FH8000CB34PR 20" Yes Clear Black 3/4"
FH8000NP34 20" No NP NP 3/4"
FH8000NP34-222 20" No NP NP 3/4"
FH8000WW34PR 20" Yes White White 3/4"
FH8000HT34 20" No Red Red 3/4"
FH8000BB34PR 20" Yes Black Black 3/4"
FH8000BL34 20" No Blue Black 3/4"
FH8000BL34PR 20" Yes Blue Black 3/4"